Today is the day the U.S. Sentencing Commission is holding its hearing on whether the recent reduction of penalties for crack cocaine as compared to powder cocaine, from 100:1 to 18:1, should apply to those convicted of crack offenses before August, 2010, when the change went into effect. The meeting agenda with links to written testimony is here. What a mess. The U.S. Sentencing Commission implemented its emergency temporary amendments to the crack cocaine guidelines to comply with the Fair Sentencing Act passed by Congress that reduces the penalties for crack cocaine to be more in line with those for powder cocaine (roughly 18 to 1 instead of 100 to 1) and how did they do it? The House of Representatives has passed S. 1789, the Fair Sentencing Act of 2010. 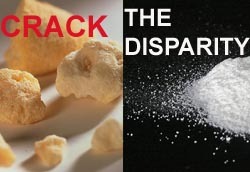 It reduces the disparity between crack and powder cocaine penalties from 100:1 to 18:1. It also eliminates the 5 year mandatory minimum sentence for simple possession of crack cocaine and provides for higher sentencing guidelines for all drugs in some cases. The bill, a compromise between Sen. Richard Durbin and Jeff Sessions, has already passed the Senate. It will now go to President Barack Obama for his signature. Here's a copy, as introduced in March, 2010. What about retroactivity? The bill does not provide retroactive relief for those already serving long crack sentences. But I'm not seeing anything in the text prohibiting it, it seems to be silent on the issue. Does the silence mean the Sentencing Commission can decide to apply it to those already in prison? And would it? The Supreme Court today ruled against Percy Dillon in his challenge to to his sentence for crack cocaine. Details of the case are here. [T]he issue is whether the two level reduction in federal sentencing guidelines for crack cocaine implemented a few years ago allows judges, when implementing the reduction, to conduct a complete resentencing. The Supreme Court says "No." The opinion, written by Justice Sotomayor, is here. The new sentencing guidelines with reductions in crack cocaine sentences went into effect two days ago. In two days, the courts have granted 400 motions for sentence reductions. A few inmates have been able to leave jail immediately. These reductions are modest in size, don't apply to everyone and should be heralded by everyone concerned about justice and fairness. The exceptions, not surprisingly, are the Bush Administration and Attorney General Michael Mukasey, who continue to criticize the reductions. Sentencing Law and Policy has much more on how the implementation of the reductions is progressing. I'm looking forward to a Democratic President in November who will provide Congress with an impetus to move on legislation that will eliminate the sentencing disparity between crack and powder once and for all, and also reduce or eliminate the true cancer on the criminal justice system -- mandatory minimum drug sentences. Dorothy Gaines, who was charged with conspiracy to deliver crack cocaine due to her then-boyfriend’s alleged participation in a large-scale drug operation as a driver. Ms. Gaines served 6 years of a 19½ year sentence before being granted clemency by President Clinton in 2000. Karen Garrison, whose sons are currently serving 15+ years in federal prison for non-violent crack cocaine offenses. Kemba Smith, who was convicted in 1994 and sentenced to 24.5 years on charges of conspiracy to distribute crack cocaine and related charges after a failed relationship, despite her lack of involvement in any drug dealing operation. The ACLU's written testimony on the need to reform these draconian, unfair penalties is here. Bump and Update: The ACLU reports on Mukasey's testimony today. The Washington Post and Sentencing Law and Policy have more. Bad news from Attorney General Michael Mukasey today. In written testimony to be delivered at a House Judiciary Committee hearing tomorrow, he will ask Congress to block the release of crack offenders currently serving sentences except for first-time, non-violent offenders. It's unclear whether Congress would act in time. Adam Liptak in the New York Times has a new column on the recent sentencing guideline reductions for crack cocaine. He posits that as a result of the reductions, Congress may be less likely to reduce mandatory minimum penalties for crack cocaine since Judges now have more discretion in sentencing and Congress won't want to give judges unfettered discretion. There are several bills kicking around Congress meant to harmonize cocaine sentencing laws. But, perhaps perversely, the Supreme Court’s decisions last Monday may make Congressional action less likely. Letting judges have too much discretion does not sit well with some legislators, and that discretion can be controlled through mandatory minimums. His source for that theory is former (very conservative) Judge and victims' rights advocate Paul Cassell. I've never agreed with Cassell about anything, particularly his attempts to repeal Miranda rights, push the death penalty and make light of false confessions and wrongful convictions, but I sure hope he's wrong on this one. Fifty grams of crack equals a guaranteed 10 years. It takes five kilograms of powder to mandate the same sentence. Five kilos is a lot of cocaine. I think that's a backwards way of looking at it. The better view is that ten years is a long jail sentence -- for any non-violent drug offense, regardless of the quantity. I'm wondering if Liptak's use of the phrase "a lot of cocaine" is the result of someone whispering in his ear that the only way the crack penalties go down is if the powder penalties go up. That would be a terrible injustice. The pending reform bills are here. Two call for equalization. The bills could be put on the agenda early next year. It's time to start contacting your Senators and Congresspersons and telling them to equalize the crack and powder cocaine penalties at the current powder levels. Two wrongs don't make a right. There will be a Democratic debate tomorrow in Iowa, where the January 3 primary essentially is a toss-up between Hillary Clinton, Barack Obama and John Edwards. In light of the Supreme Court decision this week in Kimbrough v. U.S. (pdf)authorizing federal judges to consider the great disparity in penalties for crack and powder cocaine offenses in deciding whether to sentence crack defendants below the federal sentencing guidelines ("...it would not be an abuse of discretion for a district court to conclude when sentencing a particular defendant that the crack/powder disparity yields a sentence “greater than necessary” to achieve §3553(a)’s purposes") and yesterday's decision by the U.S. Sentencing Commission to make retroactive the recent and relatively minor crack cocaine sentencing guideline reductions, I'm hoping the candidates will be asked their positions on mandatory minimum sentences and what they will do as President to change them. I've put together a chronology of how the mandatory sentences came about and what efforts to change or resist changing them have been made since. How Will the Courts Resentence Crack Cocaine Offenders? In light of yesterday's decision by the U.S. Sentencing Commission to make the reduction in federal sentencing guidelines for crack cocaine offenses retroactive, many are wondering just how these reductions will be effected. The bill insufficiently cuts the disparity between crack and powder. Instead of 5 grams of crack, the threshold for the 5 year mandatory minimum sentence would be 25 grams. For powder, it's currently 500 grams. The bill does eliminate the mandatory minimum for first timers who possess for personal use. Joe Biden's bill, S. 1711, co-sponsored by John Kerry, Russ Feingold and Carl Levin is better. It equalizes the penalties between crack and powder at the current powder levels. But, the reductions are not retroactive, so they won't help the 19,500 offenders currently serving the disparate sentences. By a unanimous vote, the U.S. Sentencing Commission has made its November, 2007 reduction in crack cocaine penalties retroactive. The effective date is March, 2008. The statement is here. Not every crack cocaine offender will be eligible for a lower sentence under the decision. A Federal sentencing judge will make the final determination of whether an offender is eligible for a lower sentence and how much that sentence should be lowered. That determination will be made only after consideration of many factors, including the Commission’s direction to consider whether lowering the offender’s sentence would pose a danger to public safety. In addition, the overall impact is anticipated to occur incrementally over approximately 30 years, due to the limited nature of the guideline amendment and the fact that many crack cocaine offenders will still be required under Federal law to serve mandatory five- or ten-year sentences because of the amount of crack involved in their offense.